So the news is out. Yahoo plans to shutter Delicious, the largest social bookmarking site. Which is shocking, particularly among the tech savvy and socially oriented. Delicious is iconic for its application of social sharing and collective intelligence. Hard to believe Yahoo wants to shut it down. But wait…this doesn’t have to be the end. Why not seek alternatives to shutting down the service? Might there be a logical company to take on Delicious, and all the value it holds? Why yes, one company comes to mind. “Organize the world’s information.” Now, doesn’t that sound like the kind of thing that applies to Delicious? Millions of people organizing the world’s information, according to their own tags. Which makes it easier to find for others. Crowdsourced curation. For that reason alone, Google would be wise to take on Delicious. Google’s pagerank is amazing. It’s incredibly good at finding nuggets. But it’s not perfect, as anyone who regularly use it knows. The use of links is powerful, but is a limited basis for identifying valuable web pages. What people elect to bookmark is a different sort of valuation. Which is important, because not everyone blogs, or creates web pages with links to their favorite sites. But there is a distributed effort of indicating value via bookmarking. Google could leverage the activity of Delicious users to improve its search results, or at least give users an additional place to find content. Mine the tags to provide more context and connections among pages. Note that Google, and Bing, are exploring different ways to apply social signals from Twitter and Facebook. Inclusion of Delicious in the search process would be consistent with that. And Google would still benefit from its Adwords program here. Which would be a monetization strategy for Delicious, which has no ads. Google finds itself in a fight with Facebook for employees. Google is public, Facebook is pre-IPO. Social is hot, and Facebook is dominant in that. Google isn’t. But as Allen Stern notes, Google does have a special appeal to the tech crowd for its developer-friendly moves. Stepping in and taking over a legendary Web 2.0 site like Delicious would be a good fit with that reputation. Enhance the usage of the data and make it easy for developers to access. More importantly, Delicious holds a special appeal among the geekier set. Many of us are still active bookmarkers, and use the service. Google is known for being a geek-centric paradise, with a bunch of high-GPA, advanced degree types on its campuses. So they do have some capacity, but obviously need to invest it wisely. For a relatively low cost, they gain a treasure trove of data on relevance and value, and a solid boost to their PR. Seems like a big win to me. How about it Google? Why not step in and take over Delicious? Great summary of the opportunity that Delicious represents. I wonder if this leak about Yahoo’s intentions turns out to be the best thing for them and I wouldn’t be surprised if they changed their mind and figured out a way to monetize it. Kind-of like the “New Coke” failure for Coca-Cola in the 80’s, maybe? Anyway, you make a great case for Google to buy it. I see more alignment with Twitter than with Google. Also, how would Google deal with the overlap with their own Google Bookmarks? While they’ve got the money to run it, I imagine the people inside might feel threatened by such an acquisition or have a dim not invented here mentality. Would Del.cio.us really thrive in a Google environment? At Twitter it would get the attention it needs to go to the next level of social sharing and collective intelligence. Twitter can’t take on delicious. “Collective Intelligence” does not sum up twitter very well. While they’ve got the money to run it, I imagine the people inside might feel threatened by such an acquisition or have a dim not invented here mentality. You make a great case for Google to buy it. 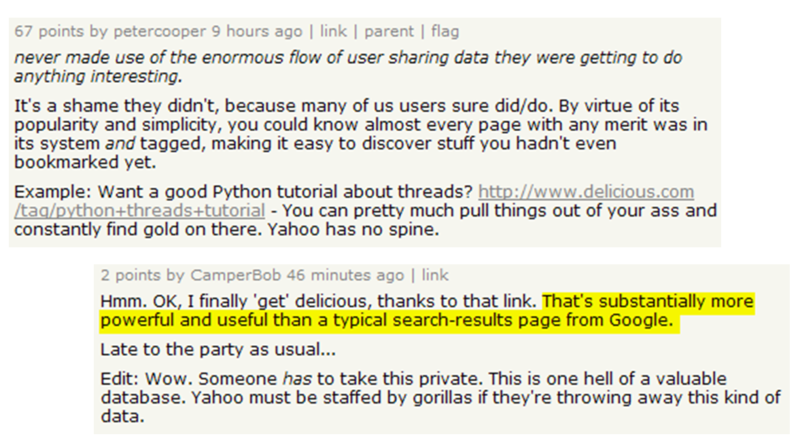 Yes i do agree with you.It would benefit google and increase it popularity and would better the search results.